Uzbekistan and Tajikistan government working groups on the delimitation and demarcation of the Uzbek-Tajik state border completed their meeting by signing the final protocol in Dushanbe. “Legal issues of passing the state border line through its separate uncoordinated areas were discussed at the meeting,” the Uzbek Foreign Ministry reported noting that, “the talks were held in a constructive spirit and a friendly atmosphere.” The details of the talks are not specified either by the Uzbek or Tajik sides - a similar reserved message is also posted on the website of the Tajik Foreign Ministry. The length of the Tajik-Uzbek border is 1,332.9 km. The land border is 1,228 km with 105 km passing along the river. To date, about 60 km of the borders of the two countries remain uncoordinated, “Asia-Plus” reminds. Mainly, these are the areas between Spitamen and Zafarabad districts of Tajikistan and Bekabad district of Uzbekistan. One of the major disputable areas is the Farhad hydro power station on the Syrdarya River and its reservoir, which both states claim. The dam of the Farhad hydropower station regulates the supply of water to the irrigation canals that serve the farmland of Tajikistan and Uzbekistan. It should be noted that after coming to power of Shavkat Mirziyoyev in Uzbekistan this is the second meeting of working groups of governmental delegations of Uzbekistan and Tajikistan on the delimitation and demarcation of the interstate border. The first took place in December 2016. Under the previous leader Islam Karimov, the solution of border issues was of a sluggish character. Until 2002, the parties determined about 86 percent of the common border line, in the same year the Treaty on the Tajik-Uzbek state border was signed. Negotiations on disputed sites have actually been suspended since 2009. An attempt to resume them was made by the chiefs of the general staffs of the Border Guard Troops of Uzbekistan and Tajikistan, at the meeting held in Khujand in the north of Tajikistan in April 2015, the first for years of independence. 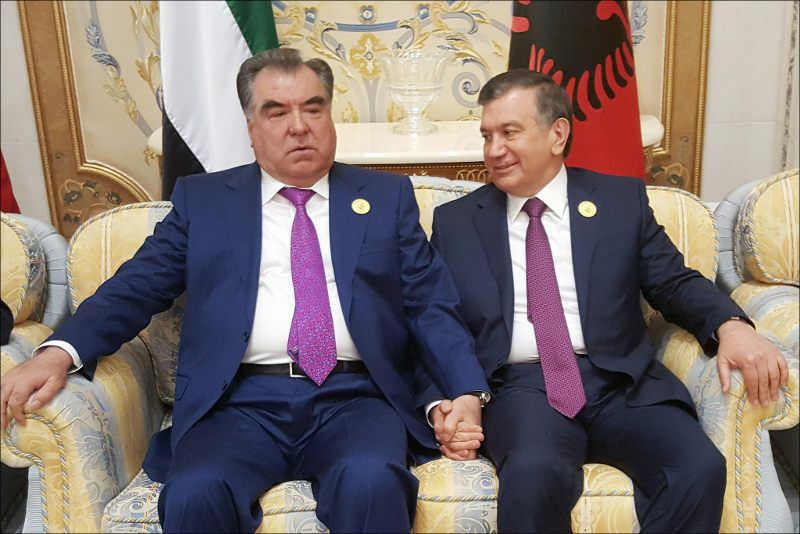 The new Uzbek president took a course toward rapprochement with neighbours, and with Tajikistan in particular. At present, an air communication between the two countries interrupted 25 years ago has resumed to operation, and trade and economic relations has intensified. The issue of easing the visa regime is under discussion. At the summit in Riyadh on 21 May, President Shavkat Mirziyoyev met his Tajik counterpart Emomali Rahmon for the first time. However, there is no information on mutual official visits yet.